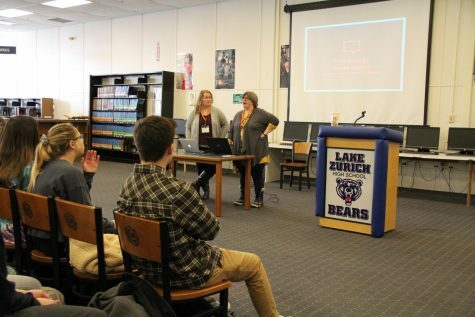 Writers from LZ and beyond gathered in the library last Friday to celebrate Writer’s Day. Authors, poets, bloggers, and podcasters lit up the room with contagious passion and electric energy. Students in their English classes and during open periods visited the annual Writer’s Day celebration, where writers of all kinds were invited to present and perform. Overall, it was a success; visitors were enthusiastic and students were an attentive audience. The architect behind the whole production was Amy Pine, librarian. Pine brought the idea for Writer’s Day over from Fremd High School where she taught for years. Though she hopes the event will get bigger in LZ, for now she’s a “one-woman show putting it all together,” Pine said. 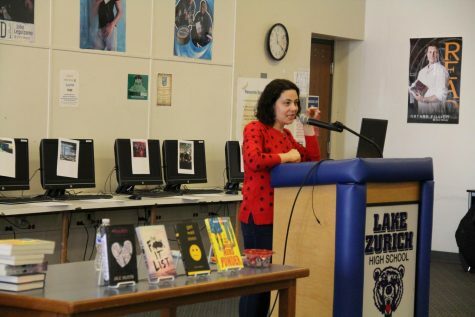 One of Pine’s guests was her high school peer Julie Halpern, author, who discussed her experiences and how she finds writing inspiration. Halpern tells students at Writer’s Day about her experiences as an author and where her inspiration comes from. Halpern loves talking to high school students and promoting writing, she said. Halpern’s value of Writer’s Day showed in her presentation. She spoke passionately about her work as an author, promoted her Young Adult novels, and even shared her own relatable story as a teenager. Student excitement and involvement in Writer’s Day is certainly the best part of the event, Pine said. Although all the speakers and performers were fantastic, and each brought unique material to the celebration, it would have been nice to have seen more students get involved by sharing their writing. Caitlyn Wenzel, sophomore, was one of the five student presenters. Pine is just as optimistic. The Three Books Podcast from Ela Library presents to celebrate writing. One of Pine’s favorite parts of the event is bringing in guests, she said. After a successful Writer’s Day, the best thing to do is explore what comes next. How can LZ make it bigger and better? The more the school encourages and excites the next generation of writers, the better. For both the school and the nation. So what is next?